Is God calling you by name? Are you looking for holy ground?” Outside the Adoration Chapel it says: “Be still and know that I am God” (Psalm 46:10). This Lent (February 13, 2013) is the perfect time to come into the Adoration Chapel to pray, light a candle and “BE STILL” so that you can hear God speaking to you in silence. 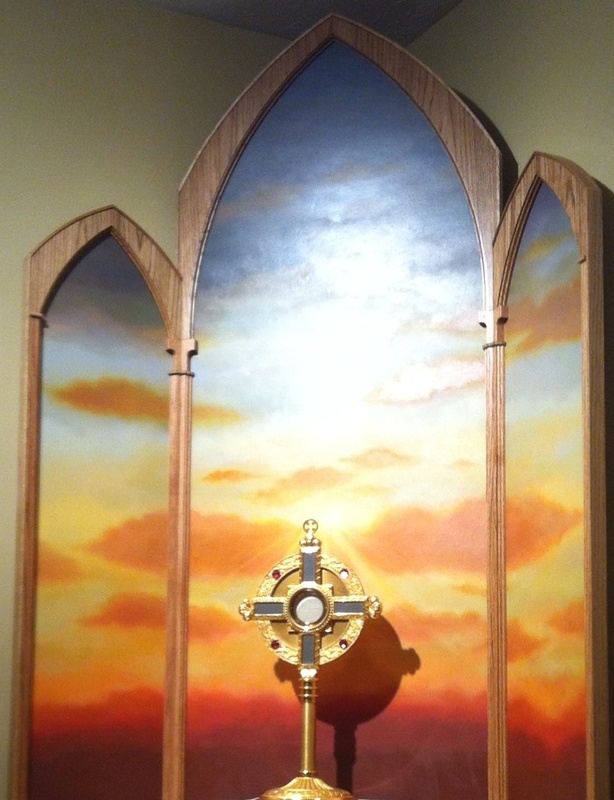 In order to properly show reverence to the presence of our Lord in the blessed sacrament, a beautiful canvas horizon of the sky will soon rest permanently behind the monstrance. The sacred art triptych will replace the temporary white fabric panels. Maybe you are one of the scheduled adorers at SLDM praying for the last 16 years since the inception of the perpetual adoration chapel by Father Donald Eder. There are currently one hour slots available 24-7 for your own committed appointment with our Lord. As always, anyone can come into the chapel at any time to experience the healing power and presence of our Lord. It truly is holy ground. Jesus is waiting for YOU. Are you listening?